Teruko Yokoi is an artist who was born in Aichi, Japan and lives in Switzerland. She has been active mainly in Europe and the United States. Just like “poems drawn with color” she calls her art works as, she creates art works on the subject of seasonal scenery and nature such as flowers by various techniques/mediums, egg tempera, oil painting, water color, lithograph and so on. Her works presents fusion of representational and abstract paintings, her colorful sense and bold composition. Born in Nagoya, Aichi and soon moves to Tsushima, Japan. From an early age receives oil painting lessons from Kouki Suzuki, a member of Shunyo-kai Art Society. Graduates from Aichi Prefectural Tsushima Girls High School (now Aichi Prefectural Tsushima High School). Goes to Tokyo, be a listener at Joshibi University of Art and Design. 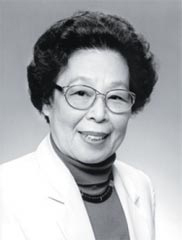 Studies under Takanori Kinoshita, a member of Issuikai. Wins prizes in Issuikai Exhibition and Nitten Exhibition. Wins prizes in Issuikai Exhibition. In January, moves to United States and enters California School of Fine Arts (now San Francisco Art Institute) in San Francisco. Her painting experiences a gradual shift toward abstraction. In April, wins fourth prize in Seventy-Fourth Annual Painting and Sculpture Exhibition held at San Francisco Museum of Art. In May, wins Japan Society Scholarship in the category of painting. In the same year composer Toshi Ichiyanagi and violinist Kenji Kobayashi win in the category of music. In July, holds solo exhibition of oil paintings at California Palace of the Legion of Honor. In September, moves to New York to study with the abstract expressionist painter, Hans Hoffman. In April, exhibits 50 sketches with India ink at the special exhibition for the 50 years of San Francisco Earthquake in National Mall in Washington, D.C..
Be warmly treated by an artist Okada Kenzo and his wife. Studies with Julian Levi at Art Student League of New York in New York. The use of color to express different atmospheres of the four seasons appears in her work. Wins prizes in Philadelphia Annual Exhibition at Pennsylvania Academy of The Fine Arts. Wins prizes in Washington Biennale at Corcoran Gallery of Art. Moves to Paris. Receives influence from Art informel movement. In November, returns temporarily to Japan. In May, moves to Bern, Switzerland. In March, she gets successful in the exhibition at Kunsthalle Basel and builds her position as an artist in Switzerland. Obtains Swiss nationality and citizenship of the city of Bern, where she currently lives. In November, Teruko Yokoi Hinageshi Art Museum is founded in Ena, Gifu. In November, Teruko Yokoi Fuji Museum of Art is founded in Fuji, Shizuoka. At present Teruko Yokoi participates in the art scene of Japn, Switzerland, Germany and the United States, where she has held more than 90 solo exhibitions. Teruko Yokoi “Comme un petit coquelicot” (Exhibition catalogue) Printed in Japan. Teruko Yokoi “The Five Seasons” (Art book) Printed in Switzerland. Copyright 2009 Ena Kawakamiya All rights reserved.